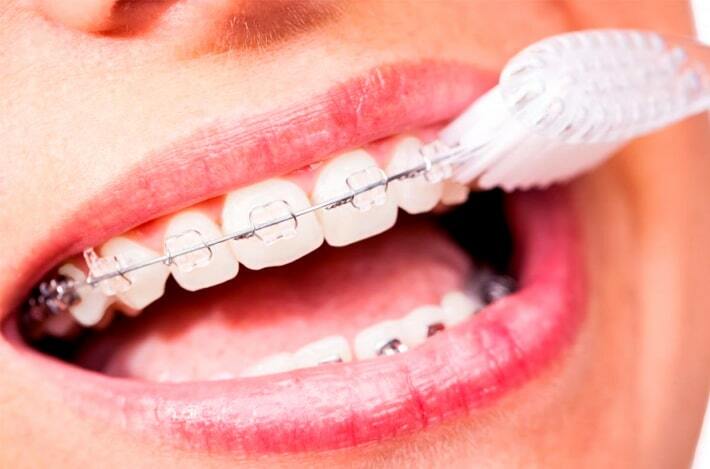 Whether you wear metal braces, ceramic braces or lingual braces, you need to know how to look after them. If you take care of your braces properly, it’ll make them much more comfortable and effective, meaning you’re a step closer to the perfect smile each day! 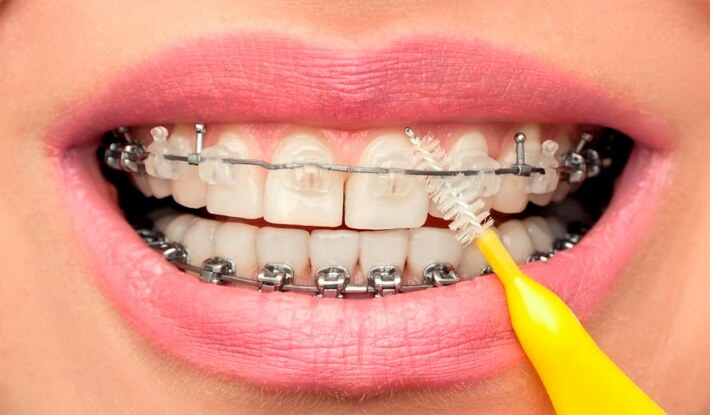 So what can you be doing to make sure you’re keeping your oral health in check while you’re wearing braces? Brushing is important whether or not you wear braces, but it becomes especially important when you’re undergoing orthodontic treatment. When you wear braces, it’s much easier for pesky pieces of food and plaque to get trapped in the brackets and cause problems, so you should use a toothbrush with a soft head to access those hard-to-reach areas. If you prefer to use an electric toothbrush, that’s fine too. Start off by brushing at the gum line of your teeth, holding your toothbrush at a 45 degree angle towards your gums. Once you’ve cleaned your gum line, hold your toothbrush at a downward angle on the top of your brackets, and then at an upward angle to clean the bottom of your brackets. Although generally people only need to brush twice a day, if you wear braces then we’d always recommend brushing after every meal. Keeping a toothbrush and a tube of toothpaste handy in your bag is an easy way to make sure your mouth is clean and sparkling! Flossing while wearing braces can be a bit of a feat, but it’s a step in your oral hygiene routine that shouldn’t be ignored. Flossing helps to remove any plaque build-up, as well as any smaller food particles that are stuck in your braces or between your teeth. If you find it tricky to floss with flossing tape, try using floss threaders for braces or interdental brushes. You can buy these in the supermarket or pharmacy, and they can help you manoeuvre around your brackets. Remember to be gentle when you’re flossing. Try not to apply too much pressure or go too quickly as you could damage your braces, which would mean a trip back to see the orthodontist! Very few foods are actually off-limits when you wear braces, but your orthodontist will give you a list of foods you should avoid while undergoing treatment. A heads up – anything chewy, sticky, crunchy or hard is likely to be on the list. Plus, if you’re the sort of person who’s always nibbling on your nails or chewing pen lids, you’ll need to curb that habit pretty quickly too! These types of habits and foods can break or bend the braces which is never a good thing. You should also avoid sugary foods and drinks as these can cause staining and decay around your brackets. These stains can be permanent, and will become more obvious later when the braces are removed, which will not help you to achieve the perfect smile. If you’re wearing braces, you’ll want to do everything in your power to make sure you’re going to get the best result. Keeping your teeth clean, taking the time to floss, and thinking about the food you eat are simple but effective steps to make sure you’ll have a perfect smile when the braces come off! For more information about the dos and don’ts of wearing braces, take a look at our Kids and Orthodontics eBook.